My little guy has been slightly under the weather. He didn’t eat much yesterday and when I asked him what he wanted for dinner he said, “Mac-n-cheese.” So of course that is what I made. I didn’t have nice elbow macaroni on hand. So I actually used the macaroni from the Kraft mac-n-cheese boxes and discarded the orange cheese powder. 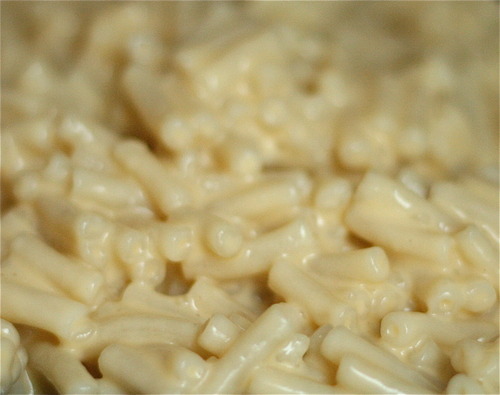 I never follow a recipe when I make mac-n-cheese from scratch. I usually just do it by flavor. A characteristic I get from my Mom. :) Here is the recipe I recorded. It is always a huge homerun at The Smith House! Roughly 16 ozs uncooked elbow macaroni or any other pasta of choice. I’ve made it with penne, corkscrew and bowtie. (whatever the cook time is on the pasta I use, I like to boil it a minute less to al dente. So if the cooking time is 10 minutes, I’ll do it for 9. Pasta does continue to cook after the water has been drained off). Grate the cheese and set aside. I used monterey jack and mild cheddar because that is what I had on hand. The beauty of this recipe is, you can use the cheese you like the best! Be creative! 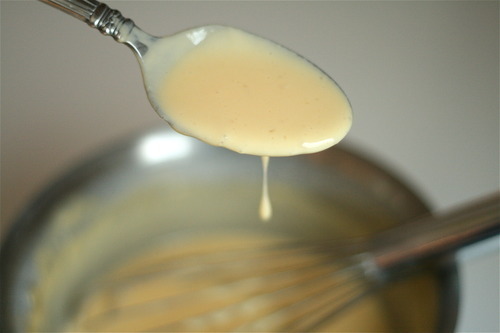 Pour milk into a medium sauce pan and on medium heat, bring to a slight boil. Turn heat to low and measure out the 2 tbs of cornstarch and put it in a liquid measuring cup. Spoon some of the hot milk in with the cornstarch and mix thoroughly. Add cornstarch mixture back into pan and turn heat back to medium to boil again. Stirring constantly. Once slightly thickened add the cheese. Mixing until completely melted and smooth. Add the hot sauce. And then salt and pepper to your specific tastes. Combine homemade cheese sauce with pasta and BAM! You will never go back to Kraft!